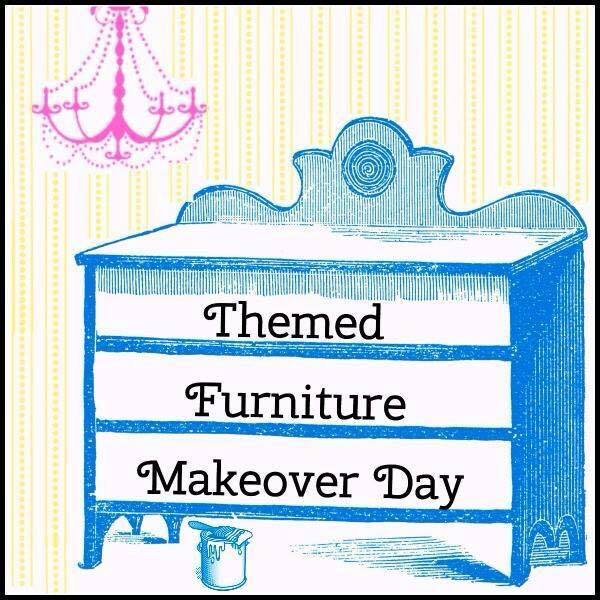 The jury is in…the Themed Furniture Makeover Day has become one of my favorite days of the month. Can you blame me? What better than to get down and dirty with furniture AND do it alongside these fantastic ladies who have the same passion. It’s WIN-WIN! 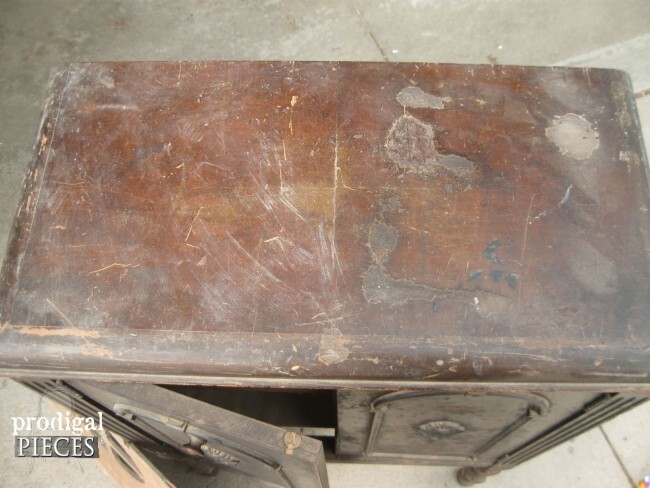 Today it’s all about being “Distressed” – the furniture that is. About a year and a half ago, I was driving home down our street and noticed what appeared to be a teeny tiny garage sale on the corner. It basically was a few pieces of furniture and, of course, that caught my eye. With kids in tow, I pulled over and got out to take a quick peek. Oodles of damage, door beaten in and missing all sorts of stuff, but in otherwise structurally good standing. Cha-Ching! It wasn’t until a couple of months ago I was able to give it its rightful makeover. 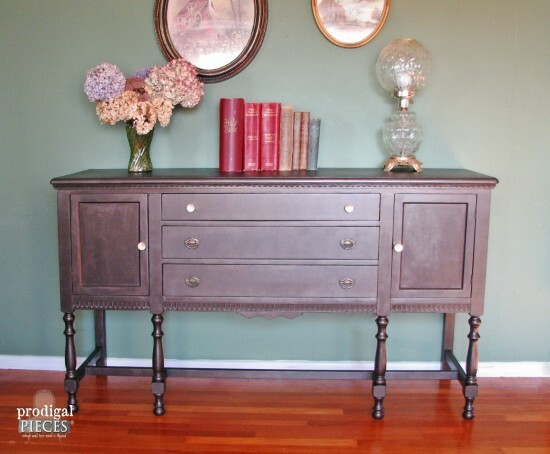 Using my Modern Masters English Brown Metallic Paint and a whole lot of TLC it was given new life. Much better, right? Damaged veneer, busted off back, missing pull, but also structurally sound. Cha-Ching! 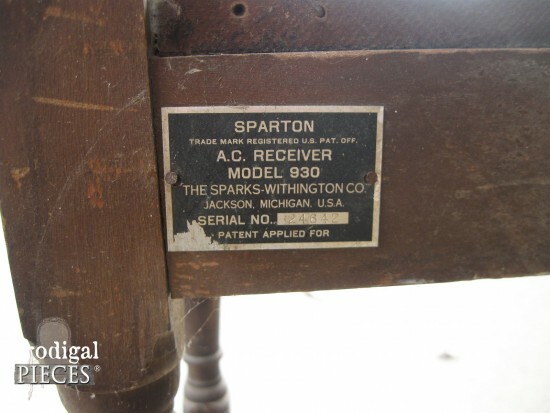 It even has the original label on back. Since this piece was unique, I didn’t want to just do a standard makeover. No, it needed to be sweet. I had sooo many ideas for this empty carcass. One thought was to turn it into a doll house. Another idea was a little girls wardrobe. 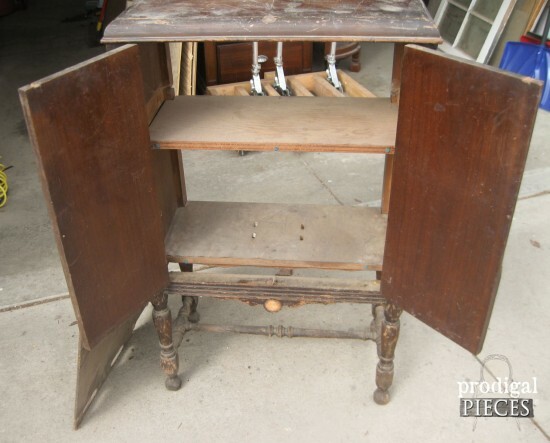 The one thought that stuck to me best was a sewing cabinet. A place to store all the essential notions, bits and baubles a seamstress needs. My mind was made up. 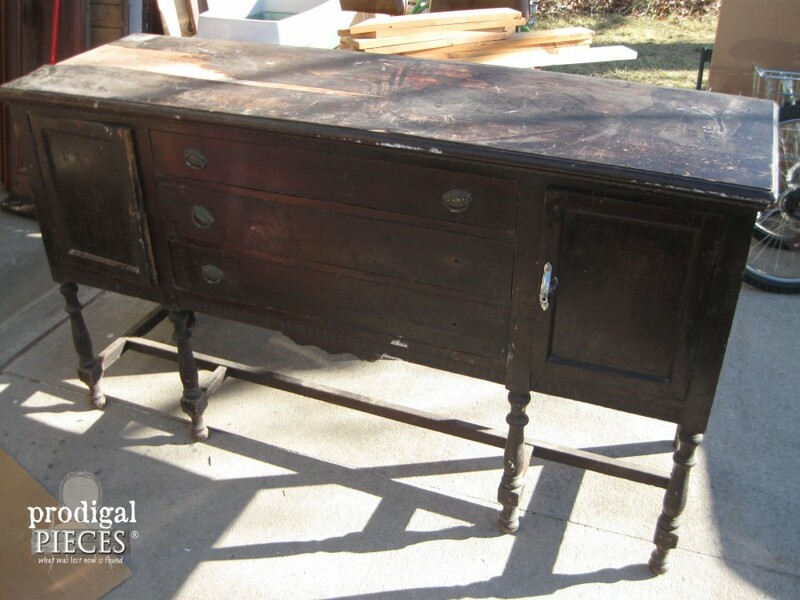 All this little antique needed was some TLC. 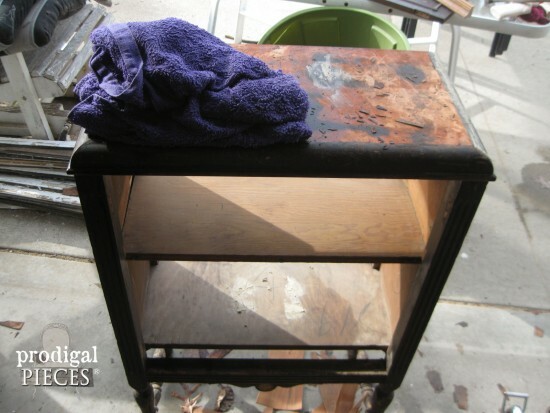 After doing a bit of veneer removing using my towel method, the cabinet was ready for its colorful coat. The doors had some missing trim, and I found the perfect piece in my stash to replace it. The front bottom had a rather large gap, and again my stash came through for me and I was able to add trim to complete the finishing touches. Now for the color. Thumbing through a recent magazine, I saw a little side table on the cover in a perfectly chippy state. That green drew my eye in and I knew my little cabinet would look perfect in that spring-like shade. 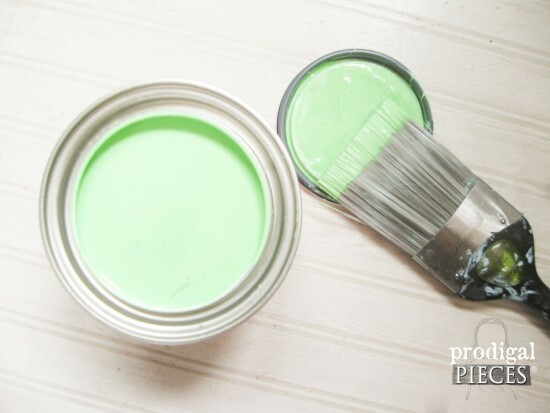 It’s called “Lucky Lime” by Glidden…isn’t that the most perfect color name for this piece? Don’t you just love that soft color? At another local garage sale I found three rolls of lovely floral wallpaper for 50 cents a roll. (did I ever mention I love garage sales?) Perfect for making an eye-popping interior. Now my heart starts to get excited on how it all is coming together. A little white glazing, some accented pinks, and that wallpaper. 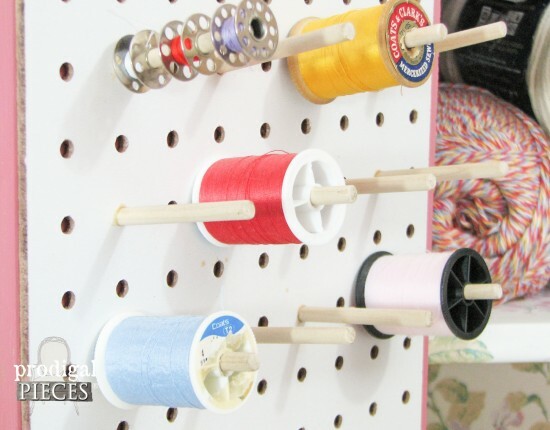 Any good seamstress has oodles of thread and essentials for sewing, so what better than a built-in thread rack? Some simple dowel and peg board added to the inside of the doors, creates versatile storage space, perfect for all sorts of sewing candy. 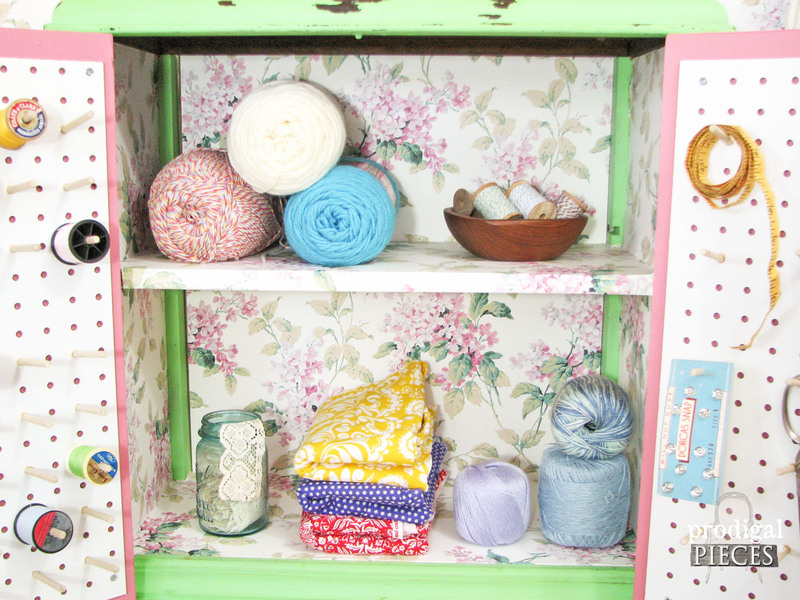 I’ve thought of using old entertainment centers to create a larger sewing storage piece, and if you want to do it too, it’s very simple. I just made sure to cut my dowels on a simple mitre box using a 22.5 degree angle since my rack was going to be swung in and out – otherwise the spools fly off every time you open it. 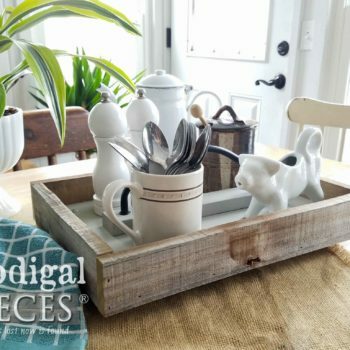 It’s certainly a keeper, but since I’m already got a different vibe going on in my industrial style sewing storage, this sweet piece has sold from my shop. There was a tug on my heart when it sold, but it was sweet while it lasted. 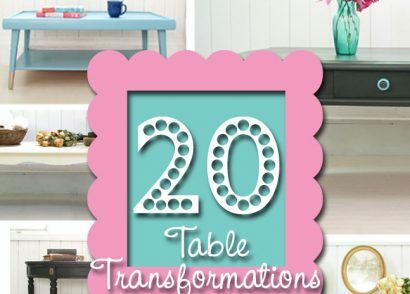 If you loved this transformation, please share! Ooh…I have to add that a few months after scoring those two pieces, the same house had this dresser sitting curbside with a “FREE” sign on it. Yup. You can read the story here…it’s a good one! 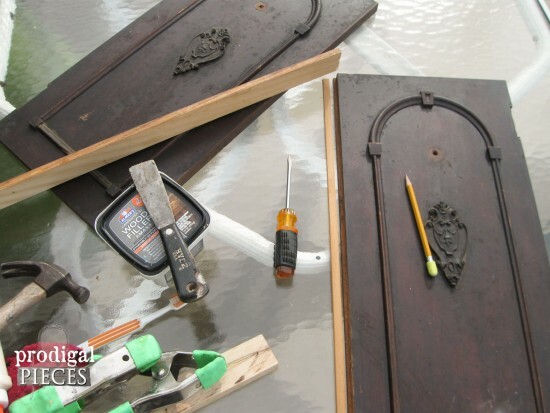 If you like this makeover, then you’ll love these projects too! Now since my piece was not the only one that got “Distressed”. I invite you to check out the other fantastic work of the ladies joining me this makeover day. 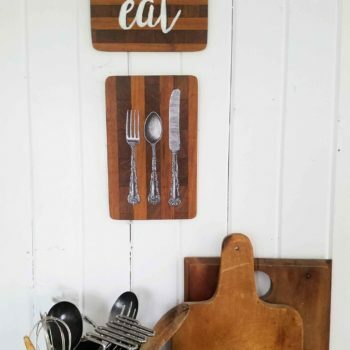 The pegboard and dowels, so smart. Turned that beauty into such a useful piece. Holy smokes Larissa, this guy clearly does not understand the value of furniture! Good for you though that he doesn’t. 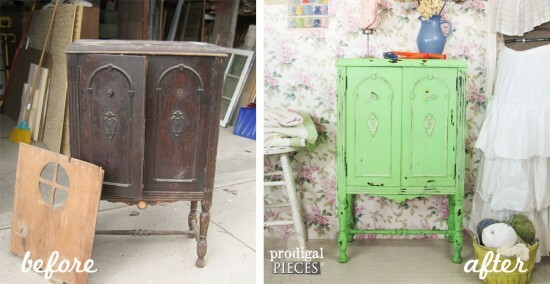 LOL Love the makeover you gave this piece from the color to the repurpose – gorgeous! I have no doubt it’s not going to sit long in your Etsy shop. I was stunned, Marie! He just wanted them gone. The house was a flipper and he did amazing on it. That MCM dresser even had an old, old, family Bible in it. A treasure. Gorgeous transformation! Love the color and all the chippy character you gave it! Thank you! That color just pops, doesn’t it? 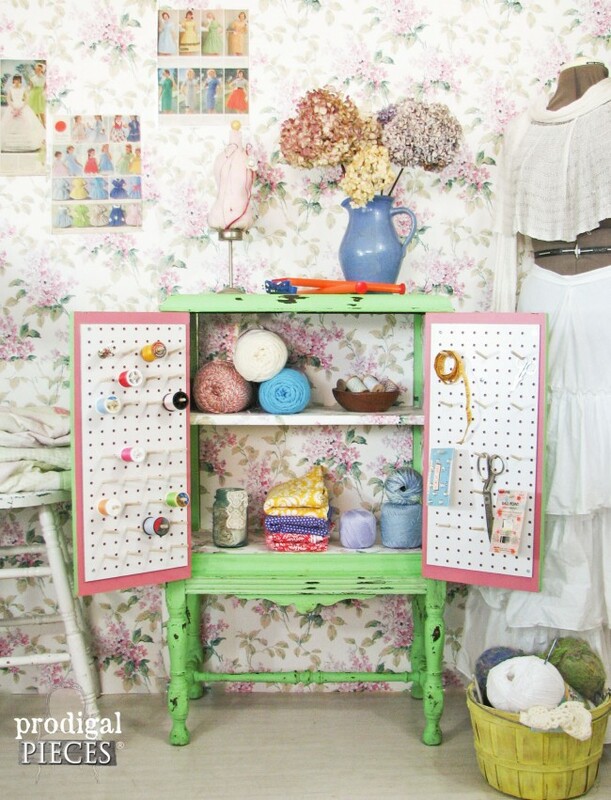 I absolutely adore your new sewing cabinet, especially the pegboards you built into the inside cabinet doors. Thanks for the great inspiration. Thank you for your sweet words. It was a fun project! 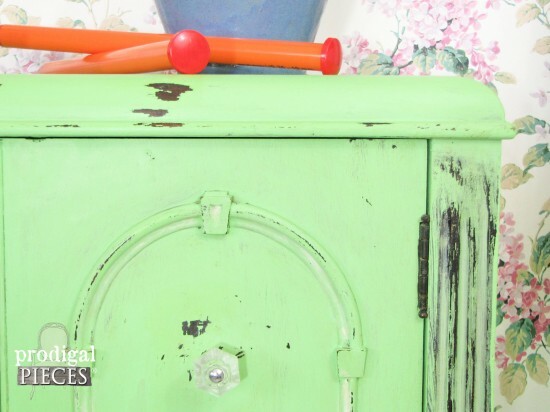 What a great use for this old stereo cabinet! I know that someone will be glad to have this for sewing storage. That color you chose might be lucky , but so are you! We don’t get those cool deals down here at all! LOVE your vision and the love you put into this one. You know it won’t last long in your shop 🙂 Great job my friend! Thanks, Wendi! Only once in a blue moon, but grab ’em when I can!! I love it – fabulous job. what an amazing idea for a piece of unique furniture. Love it. Thank you, Jeanette. I know I’ll be using this color again…it’s sooo fun! Green is my favorite color so I just adore this piece!! What type of Glidden paint did you use? What an amazing transformation, as always! I love, love the green and the sweet storage inside. $5?? I think I’m even more amazed at the $15 price tag on the sideboard!! Nice work! 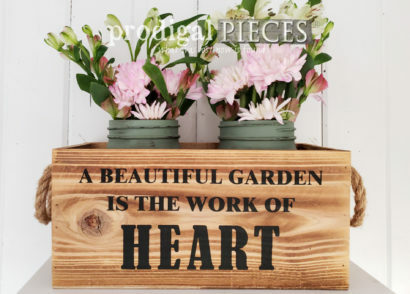 Such a great idea for this piece!! I really like what you did. You’re right, the color is perfect! That color is amazing and the inside is perfection! And what a steal!! Steal is right! Just funny it sat so long in my stash. I’m sure you know how that is…wait…you don’t have 6 kids. Just kidding. 😉 Thank you, Bre. Woot! It was a fun project. I may just have to keep it! So cute! Love the bright pretty color. I love the green! You did a great job organizing the inside. All of these are so pretty. Thank you, Jennifer! Yes, that green is so spring-like…I love it! Holy cow, girl, I hope that you have an extra bedroom, cuz I’m moving in! You find the BEST STUFF up there! 😉 Gorgeous cabinet, the green is PERFECT. Now you know why I’m a forced hoarder. Who can pass up those deals?? The cabinet looks fantastic! Really awesome makeover! Thumbs up! 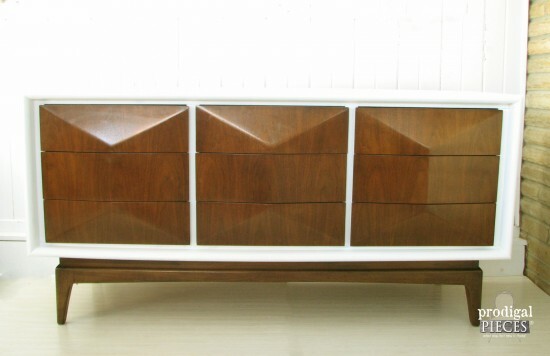 Greets, Storage Feltham Ltd.
Hey Larissa – we LOVE the transformation of this vintage stereo cabinet. 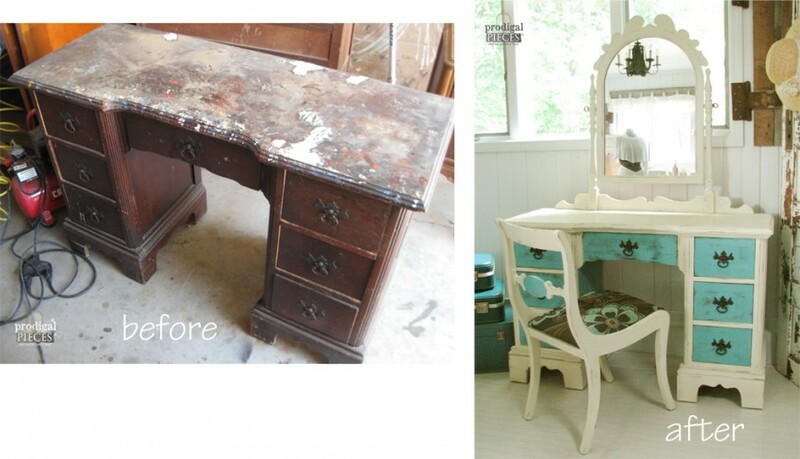 You are so creative and a wonderful furniture painter! Thanks so much for linking up with Lisa at the Something to Talk About Link Party! Wow I love it! And the color you chose-beautiful. 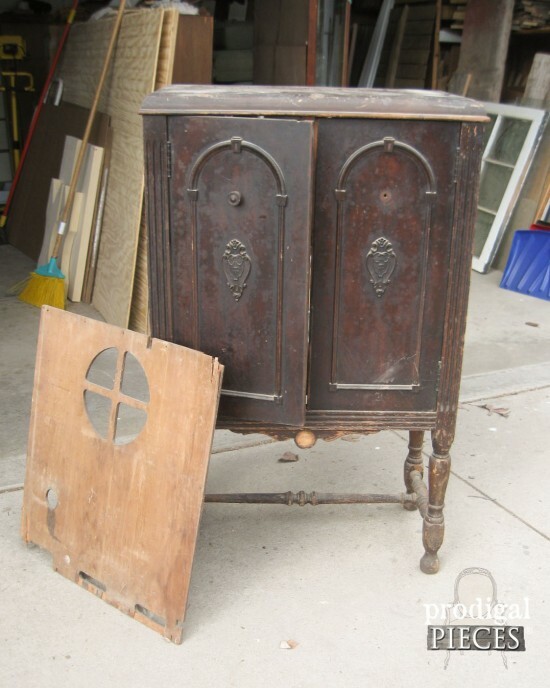 Pinning and hoping I can find such a gem to refurbish! Thank you, Mila! Yes, a score I’ll most likely never find again. It was fun! Wow, I can’t believe this transformation! 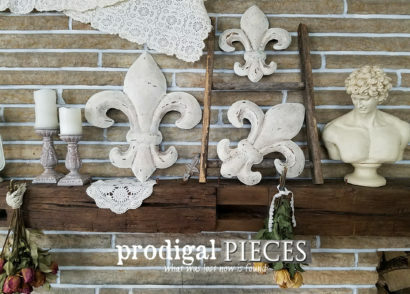 It’s just beautiful… the color, the piece itself, and what you’ve done with it! I can’t believe it was only $5 even in the condition it was in. I stumbled across your blog on the Funky Junk link party and I’m so glad I did. Your work is amazing! This is an incredible project! Yippee!! So glad to have you stop by and leave such sweet words. Thank you! I messaged you on FB with photos of your radio cabinet twin. We were willed ours by my husband’s brother when he passed away early due to pancreatic cancer. I have never really known what to do with it, but now you have given me inspiration. I am going to outfit it as a small wardrobe for our Chinese Crested powder puff, Lily. (You can see her photo in your message on my profile photo) I have been looking for a solution to keep her many outfits and grooming products organized and this will fit the bill perfectly! Thank you so much for sharing and the great idea! 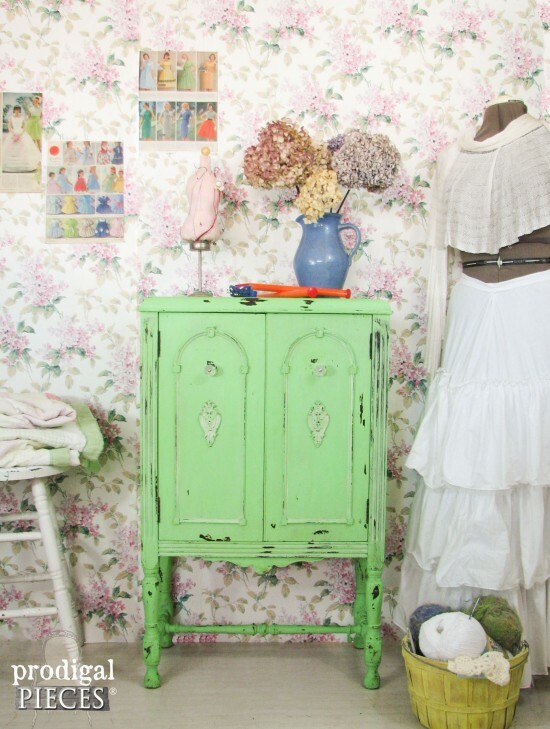 I love the way that green paps, and it is such a practical repurpose! Thank you, Mary! It is a luscious color for sure. I read through the comments and saw you said this was a Gildden flat paint, I’m in to cost effective. Is the distressing the same? Just sand to preference? And what’s your go to sealer? Appreciate the help. Again, adorable ? Thank you! Yes, just a basic paint and distresses just fine as you see in the post. Sealer depends on what I’m after. For this it is wax to give an aged appeal. Hope that helps!